Dell advanced its strategy for cloud data centers with the introduction of a top-of-rack switch with 40G fabric uplinks and Fibre Channel over Ethernet , high performance 10/40G blade switching products, and the commercial release of OpenFlow software-defined networking in the Force10 operating system. 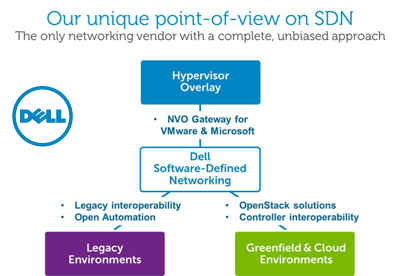 Dell said these additions underline its commitment to software-defined infrastructure. The company is pursuing a "complete and unbiased approach to SDN" by embracing legacy networking environments, greenfield controller-based deployments as well as hypervisor-oriented architectures. The new Dell S4820T top-of-rack (ToR) switch is powered by the Force10 operating system (FTOS) and designed to support both Layer 2 and Layer 3 functionality required for Web 2.0, enterprise and cloud server provider data centers. It features low cost 10GBASE-T connectivity, a common data center bridging-enabled 10G switching fabric, support for Fibre Channel over Ethernet (FCoE) using twisted-pair cabling, and four 40G uplinks providing for high-speed fabric connectivity enabling scalable multi-rack deployments demanded by larger customers. The new Dell MXL blade switch and the Dell PowerEdge M I/O Aggregator support migration of 10/40G in the data center and more streamlined architectures for server and storage connectivity. The Dell MXL - powered by FTOS and purpose-built for the Dell PowerEdge M1000e blade server chassis - is a full-featured 1/10/40GbE Layer 2 and Layer 3 blade switch that offers increased bandwidth, scalability, performance and operational simplicity for data center and campus environments. The Dell PowerEdge M I/O Aggregator offers similar connectivity options and is optimized for plug-and-play simplicity and rapid configuration-free deployments. Both products support local switching of server-to-server (east-west) traffic within the PowerEdge 1000e chassis. The OpenFlow support is now available in the FTOS code base for the Dell Z9000 and S4810 data center switches. Dell said it is fully compliant with available standards-based OpenFlow controllers, including the Big Switch Controller from Dell partner Big Switch Networks. Telefónica Deutschland has demonstrated multivendor handover of Voice-over LTE calls to 3G using Single Radio Voice Call Continuity (SRVCC). The handover test was achieved in Germany in a laboratory environment that simulates a real mobile network. Handsets and network components from at least six different manufacturers have been used, including Acme Packet, Ericsson, Huawei, NSN, Qualcomm and Sony Mobile. Telefónica said future benefits of VoLTE could include HD voice services, faster call set-up, HD video calling, chat applications and other rich-media services from any device or location. "Telefónica has achieved a significant landmark with the successful testing of this mobile broadband network for the future,” said Enrique Blanco, CTO of Telefónica. “Most importantly, however, is our ability to deliver the very best customer experience – which is at the core to our long-term network strategy. With VoLTE, our customers will be seamlessly connected to a superfast intelligent network that not only gives a top quality voice service – but also a network that opens up a new world of opportunities, such as high definition video calls". Sprint reported Q4 revenue of $9 billion and full year 2012 consolidated net operating revenue of $35.3 billion. There was a net loss of $1.3 billion and a diluted net loss of $.44 per share for the fourth quarter of 2012 as compared to a net loss of $1.3 billion and a diluted net loss of $.43 per share in the fourth quarter of 2011. Wireless service revenues for the Sprint platform grew 12 percent year-over-year for the quarter and nearly 15 percent for the full year thanks to increasing postpaid ARPU and subscriber growth. Postpaid subscriber net add in Q4 totaled 401,000 driven by a postpaid Nextel recapture rate of 51 percent, or 333,000 subscribers, and strong 4G LTE smartphone sales. Sprint platform prepaid net additions equaled 525,000 due in part to the best ever quarterly prepaid Nextel recapture rate of 50 percent, or 188,000 subscribers. Sprint sold approximately 2.2 million iPhones in the fourth quarter with 38 percent purchased by new customers. As of the end of the fourth quarter, Sprint had sold more than 4 million 4G LTE smartphones. For all of 2012, Sprint sold 6.6 million iPhones. In Q4, over 6.1 million smartphones were sold. Network Vision is on track: the number of sites that are either ready for construction or already underway has grown to more than 19,500 – approximately half the total number of sites to be upgraded. To date more than 8,000 sites are on air and meeting speed and coverage enhancement targets. Recent weekly construction starts are up 56 percent from the third quarter. 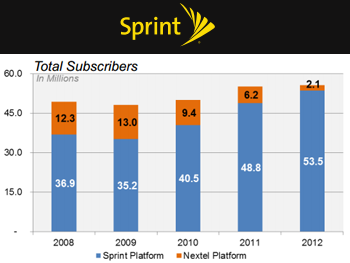 Sprint continues to expect to have 12,000 sites on air by the end of the first quarter of 2013. Network Vision leasing is complete at over 27,000 sites and zoning is complete at nearly 29,000 sites. Sprint is on track to shut down the Nextel network by the end of Q2. Sprint has now launched 4G LTE in 58 cities and expects the service will be available in nearly 170 additional cities in the coming months. Activation of 800 MHz spectrum for CDMA voice is underway. Citing persistent cautious spending in Europe and low activity in China, Alcatel-Lucent reported revenue of Euro 4.096 billion for Q4 2012, down 1.3% YoY but up 13.8% compared to the previous quarter. At constant currency exchange rates and perimeter, revenues increased 16.2% sequentially and decreased 3.9% year-over-year. Gross margin came in at 30.4% of revenue for the quarter, compared to 34.4% in the year ago quarter and 27.9% in the third quarter 2012. Fourth quarter reported net loss (group share) came in at Euro (1.372) billion or Euro (0.60) per share, including restructuring charges of Euro (247) million and other adjustments. 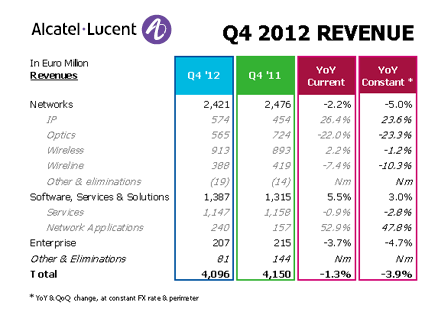 For Q4, Alcatel-Lucent's Networks posted a mid single-digit decline year-over-year, a substantially lower rate than in the first three quarters of the year. The IP business recorded a double-digit increase and its highest revenues level ever, while Wireless stabilized after four quarters of double digit declines, driven by US service providers stronger spending. The Optics business declined at a double digit rate, driven by muted spending in terrestrial and low point in submarine. The Wireline business declined at a low double digit rate in the fourth quarter. The Software, Services & Solutions (S3) segment shifted to positive territory, benefiting from Network Applications’ strong performance. The Enterprise segment posted a mid single-digit decline. From a geographic standpoint, also adjusted for constant currency and compared to the year ago period, North America posted a 10% growth rate. Asia Pacific posted a low double-digit decline, traction in Japan being offset by continued low activity in China. Europe declined at a low double-digit rate. Rest of world was resilient, driven by continuous traction in Brazil and by Middle East and Africa, which returned back to growth after several quarters of decline. Fujitsu Limited and Panasonic Corporation agreed to combine their semiconductor businesses into a new company with a fabless business model. A memorandum of understanding (MOU) envisions a new integrated company that focuses on key fields, including LSI devices for high-performance servers and networks in cloud infrastructure, visual and imaging solutions (next-generation DTV, applications for image recognition, etc. ), and wireless solutions (mobile and extremely low-power wireless connectivity solutions that support ubiquitous networks). Fujitsu and Panasonic will have the backing of third party investors, including Development Bank of Japan. Fujitsu and Panasonic said bringing together their respective advanced technologies and customer bases is vital to build a competitive business globally. Specifically, the plan would consolidate the design and development functions of the system LSI businesses of Panasonic and Fujitsu Semiconductor. TIM Brazil has deployed a coherent 100G WDM network over G.653 optical fiber using equipment from Huawei. The G.653 optical fiber (also called dispersion shifted fiber) used on TIM's current networks was generally thought to be incompatible with 100G long-haul WDM due to strong non-linear effects such as four-wave mixing (FWM). Huawei said it was able to overcome these long-haul constraints using modulation format technologies, non-linearity suppression algorithms, and PMD compensation algorithms. Consequently, 100G signals over 1,000km spans have been maintained. TIM Brazil is a subsidiary of Telecom Italia. Charter Communications, which is the fourth largest cable operator in the U.S., will acquire Cablevision's Bresnan Broadband Holdings (Optimum West) for $1.625 billion in cash. Optimum West manages cable operating systems in Colorado, Montana, Wyoming and Utah that pass more than 660,000 homes and serve 304,000 video subscribers and 366,000 customer relationships. "With this transaction, Charter will acquire some of the fastest growing cable assets in the United States," said Tom Rutledge, Charter's President and CEO. "These former Bresnan properties operate in growing communities, and the network, employees and customer base have been well served for many years. In particular, over the past two years Cablevision, as Optimum West, has grown video, Internet and telephone customers through the execution of a product and service strategy, which is the same as the one we recently implemented at Charter. Optimum West is an ideal fit for Charter and we anticipate an efficient integration process."